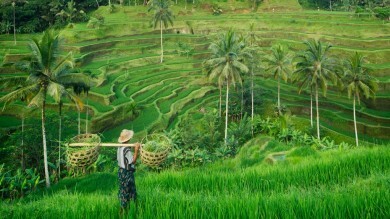 Customize your trip with a local travel expert in Indonesia. The Pura Tanah Lot is a temple dedicated to the God of Sea and can only be accessed during low tides. 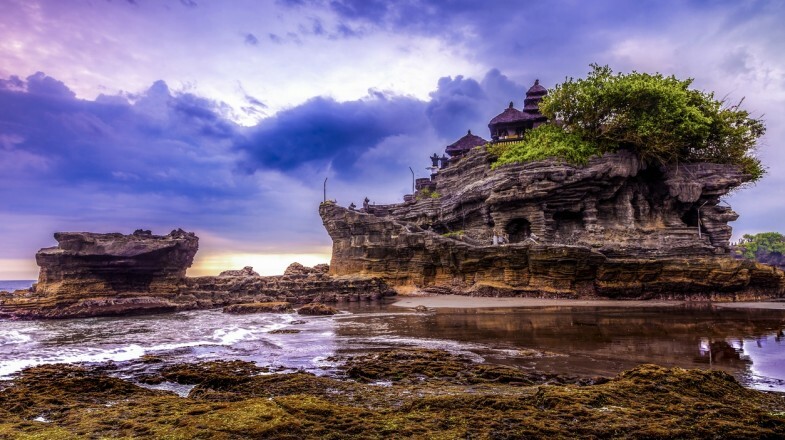 The coastal temple Pura Tanah Lot is located in the southern part of Bali, North West of popular southern destinations like Kuta and Seminyak. It is vastly known as a destination for epic photography. This cultural icon is among the seven sea temples located in the coast of Bali and has been contained in Balinese mythology for centuries. The temple continues to stand strong today, although it has had its fair share of aging, as back in the 80's the temple started to crumble and about one third of the rocks at the base of the temple had to be replaced with artificial rocks. For those who aren't aware of it's cultural representation, Pura Tanah Lot might just be another ancient ruin to mindlessly gaze at, but Tanah Lot is a place to be held in high esteem and regards, as the temple serves as an important temple dedicated to the sea god as well as a great place to witness Bali’s famous sunsets. Pura Tanah Lot is a very busy and crowded place, especially on sunny days, there are hundreds of tourists around trying to get the best views of the temple from various angles, so the best time to visit the temple is during the low seasons (mostly from mid-January to mid-April and mid-September to mid-December) during these periods there are lesser crowds and accommodation/flight costs are fair. The best time of the day to visit the temple is during the evenings at sunset, as the view is absolutely breathtaking, however, expect more crowds during this time. 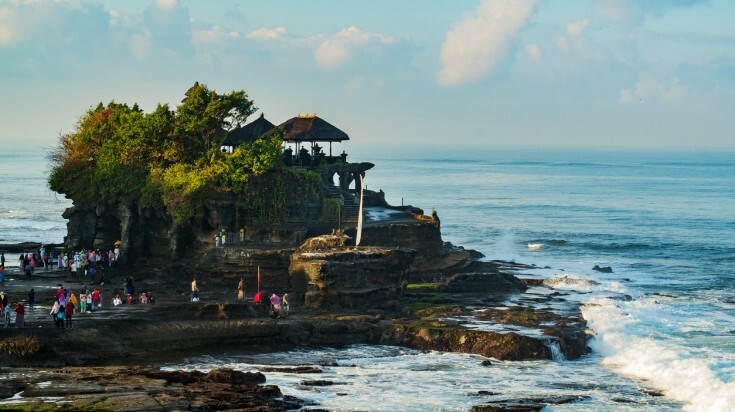 Another good thing to note is that a Tanah Lot tour is best done during low tides, because this makes for the best angle views and you are allowed to walk to the base of the temple and be blessed by the priests there. Pura Tanah Lot is only accesible during low tide. It's more than just white sands and sparkling waters at Bali's most famous beach resort. Kuta Beach is the epitome of paradise on earth, it is no wonder that it attracts thousands of people. This famous beach was once a small fishing village but now serves as a major hotspot for tourists coming to Indonesia. Which is why this is the perfect spot to relax and unwind after hours of adventuring through the glamorous base of the Tanah Lot. The beach is home to lots of surfers and many other water activities, so you might want to grab those surf boards and catch some of the best waves on the planet. Since you are already invested in temples in Indonesia, why not take your temple game even higher by paying a visit to another historical and world heritage temple in Bali. Tama Ayun is among the most aesthetically pleasing temples in Bali and is located in a mystical park sheltered by trees and ponds, just a few kilometers from the village of Mengwi (south Bali) it is a temple built to honor various historical deities and gods. The temple has a rift in form of canals and can only be accessed through a bridge that leads you to a wide spaced grassy courtyard, which leads to another courtyard that houses multiple shrines, and ponds filled with lots of lotus blossoms. Alas Kedaton is a popular monkey forest sanctuary - a sacred one at that. The sanctuary is made up of 6.4 acres of land purely inhabited by big bats and monkeys. The forest sanctuary is located at Kukuh village in Tabanan and makes for a top spot to drop by during your Pura Tanah Lot adventure. The crab-eating macaque is the major breed of monkey found in this sanctuary, and Bali in general, as these primates are native to Southeast Asia. While here, you can have a double adventure by heading to the middle of the Kedaton forest to gasp in awe at the Alas Kedaton temple; a Hindu temple relic which was built around 1178 AD. You can visit the Moneky sanctuary and Pura Tanah Lot within a day with this tour. What better place to catch up on some quality art work by famous artists like Walter Spies and many others, than the Agung Rai Museum. This museum was established by a Balinese man Agung Rai, someone who was so passionate about arts and today is home to a range of artistical masterpieces with highlights of works from 19th century Javanese artist, Raden Saleh (notable work being the drawing of the Javanese Nobleman and his Wife) and other remarkable works from the likes of Affandi, Le Mayeur, Sadali, Hofker and Bonnet. Exhibits also features works like classical Kamasan paintings and Batuan themed works from the early 30's and 40's. If you are lucky, you might witness the local kids come out to do the famous Balinese Kecak dance. Entrance gate to the Tanah Lot temple. The Tanah Lot temple is a 45-minute drive from Ubud. Bali and from there it is only a 45-minute drive from Ubud to Tanah Lot. You can easily get a taxi from Kuta or Seminyak, however taxi fares can be unreasonably priced, so be ready to bargain. The prices start at IDR 300,000* (USD 21) to IDR 100,000 (USD 7) for taxis. While getting there is a straight forward affair, returning from the destination can be a hassle, especially during the evenings when the traffic gets congested with tourist buses and taxis alike. Entrance fee costs, IDR 60,000 (roughly USD 4)*. An additional small donation is expected after entering the temple. Accessing the top of the temple is restricted to the temple’s priests and locals only. However, you can walk around the base of the temple and visit the small shrine. If crowds aren't your thing, then you might want to avoid visiting Tanah Lot during major holidays like the Nyepi Balinese New Year in March, Indonesia's Independence Day (17th August) and festivals like the Galungan -the most prestigious religious festival that is held every 210 days and lasts for 10 days. The tide is something that varies throughout the day, so you might want to check the tide times before embarking on your trip. 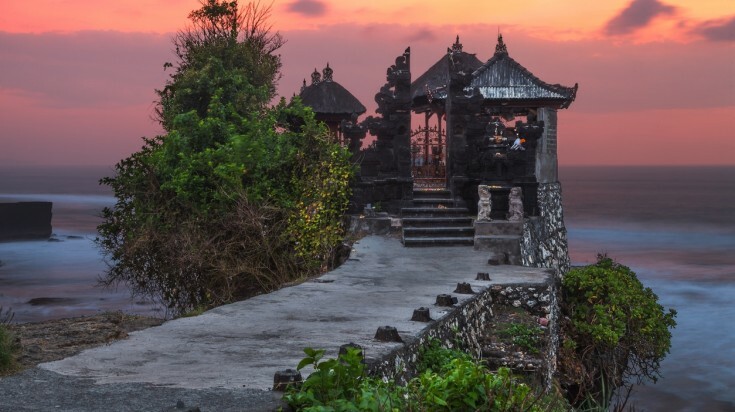 Indonesia is blessed with so many cultural sites and exotic places, Bali being a top spot on the list, and Pura Tanah Lot is without a doubt a wonderful travel destination in Bali. The beautiful temple is something everyone needs to see and experience at one point or another. *Note: Prices quoted are as per June 2018. Travelling to Indonesia? Chat with a local travel specialist in Indonesia who can help organize your trip. 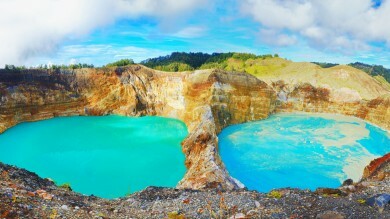 10 Mighty Indonesian Volcanos to Hike: Ready for the Challenge?